Moving toward a more progressive and culturally relevant approach to Native American health care, Indian Health Services (IHS) and the Centers for Medicare and Medicaid Services require culturally sensitive care in health care settings. In an effort to demonstrate this cultural competency, IHS hospitals now offer Native American healing ceremonies provided by traditional practitioners. But native ceremonial practices in these hospital settings are often curbed by hospital policy, according to Dr. Michelle Kahn-John, assistant professor at the University of Arizona College of Nursing. Now in the final stages of a two-year research project, Dr. Kahn-John, along with her collaborative team at the Tsehootsooi Medical Center in Fort Defiance, AZ, is assessing the effects of a traditional Diné (Navajo) healing ceremony on individuals suffering from emotional distress. 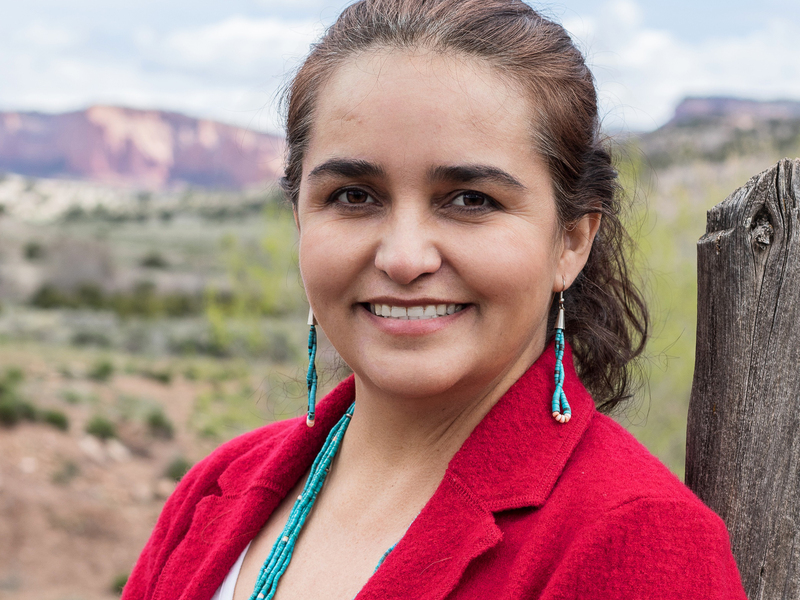 She intends to make a case for expanding the role of traditional healers/practitioners in Indian health care and tribal settings and bring recognition to the value of traditional Native American healing and ceremonial approaches to health and wellbeing. Tell us about your research project. We are exploring symptoms of emotional distress and stress-related inflammation before and after a traditional Native American ceremonial healing intervention, present for centuries within the culture. We are seeking culturally congruent ways to impact the Native populations experience increased rates of mental health conditions, including depression, emotional distress and trauma and suicide. I am interested in knowing more about the innate strengths and protective factors associated with Diné culture and whether partaking in traditional ceremonies will improve physical and psychological health. Overall, the intent of this work is to enhance the health and wellbeing of native communities. Can you tell us about the healing ceremony? The Diné ceremony is a cleansing ceremony recommended for those dealing with grief, loss, trauma or a stressful life transition. Very little can be shared about the process of the sacred healing ceremony, as I’m obligated to the Navajo Nation and Hataałii Hózhóni, the medicine man/chanter who conducted the ceremonies, to maintain the privacy of the ceremonial process. Hózhóni works at the Tseéhootsooí Medical Center and conducted 25 ceremonies for this project. The ceremony lasts about two hours and involves chanting, prayer, offerings, and body-mind-spirit purification. Can you share your inspiration for this project? In my nursing practice I’ve seen individuals who have sought out Diné traditional healing and have found very effective paths to healing and recovery for their emotional and spiritual distress. Of my 22 years as a nurse, 17 of which have been with the Navajo Nation as a psychiatric mental health nurse practitioner, I’ve focused on patients who have serious depression, post-traumatic stress disorder, complex trauma, anxiety and chronic and severe mental illness. Typically, we offer them standard western treatment: counseling, medications, group therapy and family therapy, and those approaches are mostly helpful and effective. But I really wanted to explore combining those with the healing potential of traditional practices – and approach we term integrative. I recognize that healing ceremonies are sacred to native people. Ceremonial processes are held in high regard by myself, the Hataałii, and Diné. Some may question the intent of assessing outcomes of ceremony within a research agenda, but my intent is to enhance the health of the Diné while exploring the outcomes of ceremonial practices which have been present for hundreds of years. My intention is careful and respectful and therefore we will not share the specific elements of the ceremony, but will focus on outcomes of the ceremony. How does this project relate to integrative nursing and health? Integrative nursing principles are congruent with the philosophy of Native American healing and ceremony. The first principle of integrative nursing is ‘human beings are whole systems inseparable from their environment’ and another principle is ‘nature has healing and restorative properties.’ The Diné healing ceremony addresses the complete patient, their body, mind, spirit, family and environment, and places them at the center of a healing intervention. As nurses and healers, it’s critical that we expand our awareness and knowledge of the multiple paths leading to health and wellbeing. A nurse for 22 years and a psychiatric mental health nurse practitioner for 17, Michelle Kahn-John, PhD, RN, PMHNP-BC, GNP, has spent most of her career working with the Indian Health Service on the Navajo Nation in Arizona. In 2005, she led efforts to establish the first inpatient adolescent psychiatric unit for American Indians on a reservation, where cultural wisdom and healing were integrated into the treatment model. Her work continues to shed light on the beauty and the value in Native American cultural wisdom and healing practices.